Ukraine Solidarity Campaign had received the following update from PRUP in Dnipropetrovsk. On 28 January 2015, at 14:00 hrs, a meeting of the working group with Mr. Arseniy Yatsenuk was held. Representatives of protest action participants from mining enterprises submitted their requirements / demands and told about catastrophic condition of the mining industry as well as about main problems requiring a speedy solution. They were so convincing that Arseniy Yatsenuk made a decision to set up a conciliation council on the reformation of mining industry. 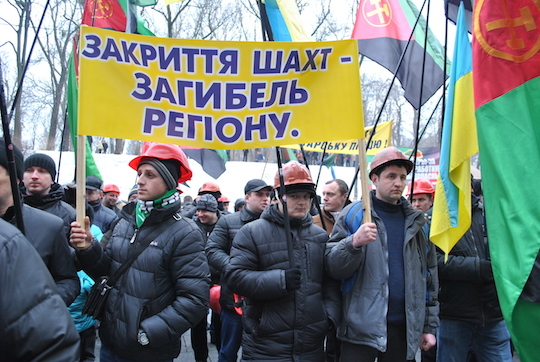 The leaders Ministries (Ministry of Power and Mining industry, Ministry of Socila Policy, and others), state-owned company “Coal of Ukraine”, state-owned company “Power Market”, people’s deputies and representatives of mining branch Unions. 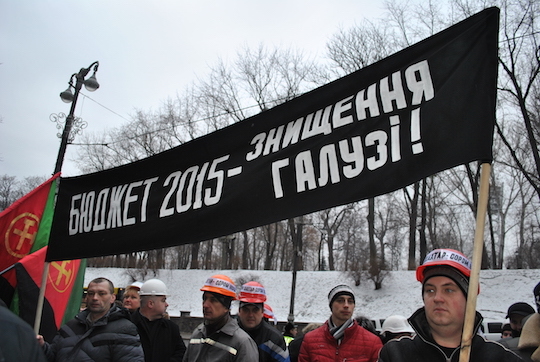 On 29 January 2015, the council holds its first meeting to specify the means of problem-solving in coal-mining industry and particular time-frame of their implementation. The key issue on the agenda is to pay a wage debt to all mining employees for December 2014. Members of the working group reported results on the meeting with the Prime-Minister of Ukraine. The Participants of the protest action made a decision to extend their picketing of Cabinet of Ministers building until the specific solution on the industry problems is made.